Recall the Sig Sauer P220, Sig Sauer's semi-automatic that became the yardstick for measuring design and performance of other pistols. Further recall the remains of its rhythm 'point, shoot, and repeat'. Finally, imagine a successor to the throne. Welcome the Sig Sauer P226, your full sized guardian pistol cannon right out of proven service to the military and law enforcement agencies. The Sig's legacy of high standards of production, service and innovation continues. The P226 itself has come a long way from its original design to the P226 Elite featuring an extended ergonomic beavertail and standard rosewood grips. Latest design variations include a diverse range of design changes. Addition of front cocking serrations and strap checkering allows for better slide control and securer grip. A propriety accessory rail allows rapid deployment of tactical devices and aiming lasers. A decocking lever and SigLite Night Sights increases functionality allowing for swifter operation. The Sig Sauer commitment to design through 'shooter feedback' can be observed from the introduction of the Short Reset Trigger (SRT). The SRT overcomes the complaints with trigger over travel of the earlier P226 versions. Sig engineers designed the SRT to provide the same safety and action of the Sig DA/SA trigger but by significantly reducing the reset time. The SRT reset is 60% shorter. This allows for faster trigger return during high speed shooting. The Sig P226 relies on the Sauer traditional Browning link less cam short recoil action. The assembly self loads with a double/single action trigger mechanism. Yet P226 introduces an innovative locking mechanism that reduces manufacturing cost. Instead of the common mechanism where the recess and locking lug are milled into the barrel, Sig has enlarged the breech section of the barrel. This locks the assembly into ejection port. This simplifies manufacture and has no functional disadvantages. Furthermore, the process saves manufacturing cost for Sig. Which, as always, is passed onto the shooters. As mentioned earlier, P266 is meant for swift point and shoot action and has no safety levers. The pistol has only three controls: a slide stop, a magazine release, and a decocker. The gun can be carried around with a round in the chamber and the hammer decocked. The downside is that this causes the relatively light single action trigger to behave like a heavier double action. The upside is that now it is less likely for the cannon to accidently go off with a light accidental trigger pull. The lack of a safety is meant to allow shooters a quick draw and employment of their P226 if deadly force is required. 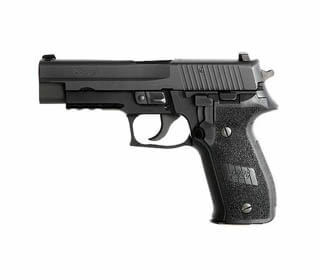 Yet to allow people a measure of comfort Sig has placed a secondary safety feature on the P226. It is integrated into the slide itself. A spring assembly holds the firing pin away from the primer of the cartridge. When engaged, a locking bar built into the slide locks the pin in place. When the trigger is pulled, a small disengages the locking bar, causing the firing pin to move forwards. If the safety is not disengaged the firing pin wouldn't move even when struck by the hammer. The Sig P226 is yet another Sig collector item that is meant for all strong hands wishing to arm themselves at price. You may now marvel, at the balance between quality and price for a fast shooting canon designed for your guard.